All Videos from Shore Coaches Can Be Found Here! What a Day! 2,000 Photos From the NB Shore Coaches Invite by Mae Kellert! Alyssa Aldridge Runs the Fastest Time in the Past Four Years at Shore Coaches! Shore Coaches Winners and Results! Well the weather was unfriendly for the meet on Saturday but the athletes worked through the elements and put together some great performances. In total 4,037 athletes competed at the historic Holmdel course. The boys fastest time of the day came from the Varsity A-2 race when Tim Bason of West Windsor Plainsboro South came storming down the final stretch. With a sub-16 minute Holmdel run in sight he surged to the final way to clock in at 15:58! His time was a whole 15 seconds ahead of the rest of the field and when looking back at the past four years he ranks fourth among some great performances at Shore Coaches. Looking at last year's full season rankings at Holmdel his time would have been 10th, this is only mid-season form and he already hit a 2 second PR at Holmdel. Robert Whitney of Voorhees had the second fastest time of the meet winning the Varsity C with 16:13. His one card wasn't made in vain with his teammates closing their top five by the eighth spot to clinch the victory! Right behind Whitney was Voorhees sophomore Chris Romero who placed second in that race, and fifth overall for the meet, running 16:18. To finish the Voorhees scoring five was Brenden McGill in fourth running 16:44, Evan Minor seventh 16:55, and Matt Vira eighth 17:07. Their strong team performance was the best of the entire invitational averaging 16:39 and only splitting 55 seconds they scored 142 points in the merged results. Some other big names individually for the boys - JP Flavin of Toms River North ran a new Holmdel best of 16:14, improving 30 seconds from this point last season he was the third fastest time of the meet on Saturday. The leading sophomore and and ranked fourth overall Justin Cornetta of Hunterdon Central ran 16:15 to place third in the Varsity A-2 race. Senior Owen Long of Haddon Twp won the A-1 race with a Holmdel best 16:20 ranking him sixth overall. To roll off the rest of the top ten times: Zach Michon of Robbinsville seventh overall at 16:21, Nicholas Pschunder of Eastern Regional eighth at 16:23, Mike Ungvarsky of Cinnaminson ninth 16:25, and freshmen Ronald Kigen of St. Benedict's Prep tenth 16:25! Other top boys teams - CBA second in the merge running their sub-varsity squad and still pumping out an impressive 16:54 average they won the A-1 race with a dominant 38 points and only splitting 29 seconds. Indian Hills won the Varsity B with 51 points splitting only 25 seconds and averaging 16:56. 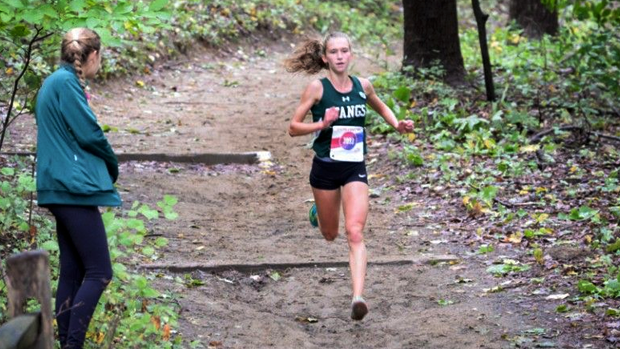 On the girls side we saw the fastest time at Shore Coaches since 2011 when Megan Lacy of Cherokee (2012) ran 18:19. Alyssa Aldridge of Mainland Regional won the Varsity B race with a time of 18:20, this came in heavy rain and after a whole day of races ripped up the course. She led her race by 58 seconds, the overall meet by 20 seconds, and now ranks tie for 35th all-time at Holmdel. Just note she was second as a freshmen at last year's Meet of Champions running 18:22 and that was during November, keep an eye out for Alyssa Aldridge! Watch the Aldridge and Varsity B Finish Right Here! There were four girls under 19 minutes, second overall was senior Hannah Bonaguidi of Delaware Valley who won the Varsity A race with 18:40. This was a great run and huge Holmdel PR for her as she ran 19:10 at Groups last year, and at the 2014 Shore Coaches she was at 20:03. That is a minute and 23 second Holmdel improvement since the same point last season. Lauren Kroepfl of Robbinsville ranked third overall with a time of 18:48, she won the Varsity E race. Sierra Castaneda was fourth overall with a win in the Varsity C race at 18:56, Castaneda is the defending Group 3 Champion and the fastest 2014 returner at Holmdel where she ran 18:22 in 2014. The girls meet team wise had huge implications on the state outlook. Ridge had a fantastic showing in the Varsity B race where they won with 61 points - 3+9+10+18+21 (47) - averaging 19:56 and only splitting 47 seconds. They were led by senior Sophie Spring in third running 19:32, that ranked her 14th in the merge. The rest of the scoring squad finished in the top 25 of their race as listed below! 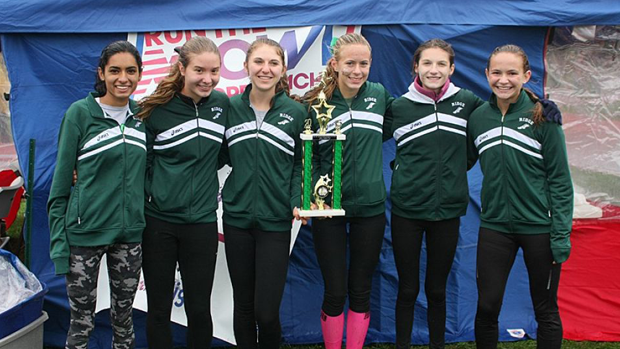 The previous NJ#1 squad Hillsborough ran a 20:25 average winning the Varsity A race with 115 points, they were led by Paige Novak in 8th running 19:40. This ranked them second in the merge team results with 395 points to Ridge's 179. 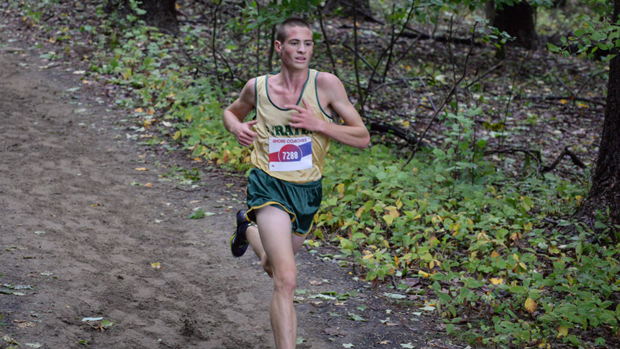 North Hunterdon was right behind Hillsborough in the merge with 396 points and averaging 20:25 as well. They were led by Anna DiMarcello who ran 19:50 in the Varsity A race but interestingly enough their rise in the Merge list came from the Junior Varsity A race where Elena DiMarcello, Angela Kearsley, and Talamo Brenna went one two and three running 20:00, 20:41, and 20:42.